Many planning efforts have occurred over the last several months in and around Lorain. The USEPA Area-wide Planning process is intended to capitalize on these efforts, not repeat or revisit the decisions made as part of them. The following are recent efforts which have been reviewed in preparation for this effort. In 2016, the Lorain County Board of Commissioners have partnered with the Lorain County Metro Parks and the four lakefront communities of Avon Lake, Sheffield Lake, Lorain, and Vermilion joined in an effort to capitalize on Lorain County’s greatest asset – its 23 miles of Lake Erie Shoreline. The project engaged Environmental Design Group (EDG) in the process and produced the Lorain County Lakefront Connectivity Plan. Click the image below to view the presentation of the plan produced by EDG. Click image to open presentation. The City of Lorain undertook a comprehensive planning process in 2016. Lorain aimed to create a shared vision that will build on the planning effort. 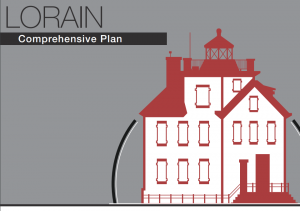 For more information, access the draft Comprehensive Plan presentation here, or visit the Comprehensive Plan website here.